Researchers have developed a new method for assessing the cultural value of landscapes using geotagged photos shared on a social-networking service. Data obtained with this method could help determine which locations should be used for tourism or targeted for environmental protection. We all know that nature provides recreational and psychological benefits to us but it is often difficult to assign monetary worth to. This research could help us determine how to strike a balance between the utilization and preservation of nature. "This type of research has received little attention despite its importance," says Tsutom Hiura of the research team at Hokkaido University. "We wanted to develop a robust and reliable method to evaluate the aesthetic value of landscapes." This is in line with the international agreement, the Aichi Biodiversity Target, which refers to the importance of ecosystem service mapping methodologies. In the study, the researchers used photos that were shared on the photo-sharing service Flickr and tied to a geographic location. The viewshed, or visible area, of each photo was assessed using Geographic Information System software. They identified locations where it appeared that many photos had been taken, and considered these as sites with high landscape "demand," which were then evaluated and given numerical scores. Next, the team used a modeling method called Maxent to identify locations that appeared to have similar environmental conditions as the locations with high landscape demand. They then evaluated the potential values of these locations, which they called the "potential supply." This method was applied to locations across Hokkaido in Japan, which indicated that landscape demand is higher in national parks followed by areas of farmland and cities. 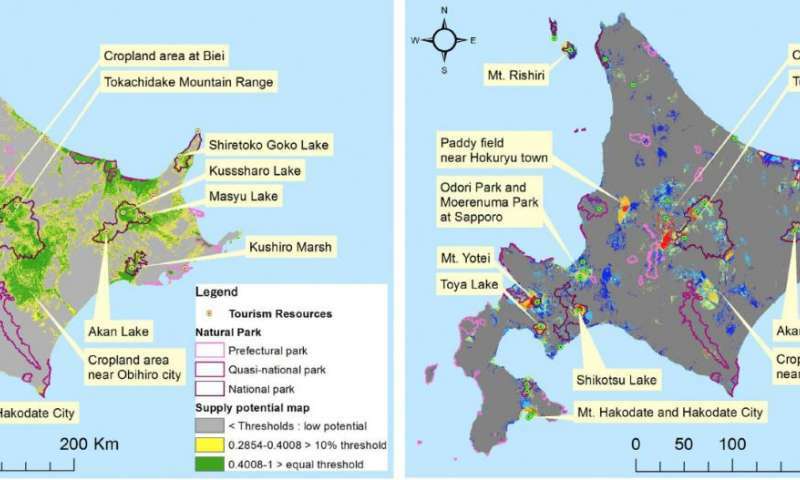 Comparisons between landscape demand and potential supply showed that, for example, Shikotsu-Toya National Park and Daisetsuzan National Park have greater potential supply than demand, while Kushiro Shitsugen National Park has greater demand than potential supply. "These kinds of comparisons could enable investigations into whether locations with high landscape demand should be targeted for environmental preservation or whether farmland could be utilized as a tourism resource," says Tsutom Hiura. The researchers plan to further improve the method and test it with other social networks. Could the commercial production of cultivated landscapes be possible?